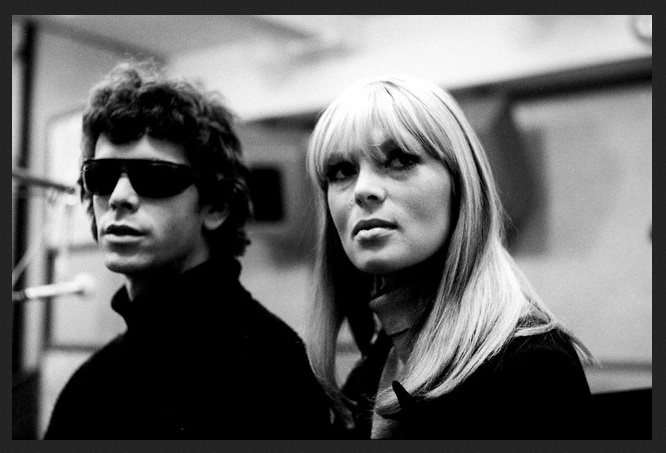 Lou Reed and Nico from the Velvet Underground. I found The Velvet Underground & Nico at the thrift store. I couldn’t afford new records, except from the cut-out bin at the Woolworth, but the thrift store yielded some early treasures. While my friends were learning “Stairway to Heaven” and “Free Bird,” I was trying to play the lead for “Sister Ray,” off of White Light/White Heat. Few girls played electric guitar amongst us, and I think that was why I was considered one of the guys. I had a white hollow body, no name, no markings, truss rod wasn’t quite right, so it went out of tune easily, but that made it easier to bend strings. I loved that thing, and I have no idea how I got it. At the time, I had a friend that drove a cab. He and I had the same last name and wore the same sized jeans, so we were going to get married. He claimed American Indian heritage, and everything we did was spiritual. Especially listening to records at his apartment and getting wasted. I was a latchkey kid extraordinaire. My friend would come and pick me up in his cab after his shift. When I scored a record we’d listen to it over and over, taking turns on the guitar. The action was pretty awful on that guitar and he’d complain that I had to get it fixed. He disappeared after awhile, as did the white hollow body electric guitar. Lou Reed remained. Years later I dated a nice guy who looked like Lou, and like Lou was adjusting to methadone clinic. His brother was a famous painter in NYC and we were going to hang with him in the Village. It never happened. But I heard stories about his brother and the loft parties and how Lou Reed would show up, and I’d listened attentively. We played with a sixties reel to reel I found in the trash in Somerville, and I’d study the photos from Lou’s Transformer days from an old French magazine that my friend had given me. He had Lou’s black leather and wraparounds down cold and rode a motorcycle. I dyed my pixie cut yellow and wore glam makeup claiming one of Lou’s looks for my own. Lou Reed had moved on from both of us. He was somewhere between “Metal Machine Music” and Honda commercials, and still a dark blue flame on the horizon. All the same, Lou Reed gave me permission to experiment in a world absent of meaning except obliteration of feeling. He gave voice to hostility and rage that I felt. His alienation was my own and he made it cool. His heartbreaking anger was really love and I knew it. He didn’t want followers, but I, like so many others, followed. I continue to try to learn the lessons from a master who remains on the horizon – a “Satellite of Love”.